Image credit: Noah Seelam/AFP | Rohingya children at a refugee camp in the Old City area of Hyderabad. Denied citizenship and persecuted in their home country of Myanmar, the Muslim minority group has found some semblance of acceptance in cities like Hyderabad. A diminutive concrete structure on Hyderabad’s rocky fringes is home to the only school for Rohingya refugees in India. Here, from 9 am to 4 pm everyday, 110 children seated on thin, striped rugs, solve simple maths problems and recite the alphabet in halting Hindi and English. “Hindi class is my favourite,” Muhammad Yacin, a lanky 10-year old in a flowing kurta told me before he darted out to play. Outside, unfinished construction sites and a stretch of patchy grass double as a playground. The school – set up by Sarva Shiksha Abhiyan, the Centre’s programme to ensure universal elementary education, Save the Children Foundation and the United Nations High Commissioner for Refugees in June – is so far from the thrum of city life that a Rohingya student can walk a kilometer without seeing an Indian, said Srinivas Reddy, the school’s in-charge. But it guarantees each student a set of clothes, three square meals a day – and for most here, their first-ever experience of formal schooling. The Rohingya, whom the United Nations groups among the most persecuted minorities in the world, are an ethnic Muslim group from the Buddhist-majority Rakhine state in Myanmar. A majority of Hyderabad’s 3,500 Rohingya arrived in India between 2012 and 2013 by boat, foot and train, after a wave of sectarian violence between Buddhists and Rohingya engulfed Rakhine and drove 1,40,000 Rohingya from their homes. They have been a stateless people since 1982, when the Burmese Citizenship Act labelled the Rohingya illegal Bangladeshi migrants, effectively stripping them of citizenship in Myanmar. Nearly every Rohingya on foreign land has one – or multiple – tales of a harrowing escape. Yet the11,000-odd Rohingya, thousands of Afghan Muslims and others seeking shelter in India from war and persecution – were conspicuously absent from a list of persecuted minorities whom the Cabinet last month offered a host of concessions. According to the announcement, Hindus, Sikhs, Buddhists, Jains, Parsis and Christians from Pakistan, Bangladesh or Afghanistan staying in India on long-term visas may now open bank accounts, purchase residential and commercial property, and apply for a driver’s license as well as PAN or Aadhaar card. The Cabinet also relaxed citizenship registration fees to a uniform Rs 100 (from upwards of Rs 3,000) and empowered district collectors in 16 districts across seven states to grant citizenship. This stands in stark contrast to the lengthy series of interviews that other refugees and asylum-seekers, like the Rohingya, go through to obtain refugee status, a UNHCR refugee card and a long-term visa. While most of the Rohingya in Hyderabad live peacefully, uncertainty haunts their rebooted lives. “Like anyone without work, we go to the adda – a place where unorganised labourers go to look for odd jobs daily. If we find something, we’ll do it. If I’m a builder, I’ll do construction work,” 27-year-old Muhammad Zubair said in a crowded tarpaulin tent in Camp 1, a hovel of around 100 families in the Balapur area of Hyderabad's Old City. Zubair said he works for 10 to 12 days each month. Most of Hyderabad’s Rohingya live in makeshift camps and small settlements on donated land scattered across the city’s outskirts. Sizable Rohingya refugee populations also live in Delhi, Jammu and Kashmir, and West Bengal. The Rohingya school in Balapur aims to pull its students – most of whose parents work as rag-pickers, laborers, and factory-workers – out of this penury. 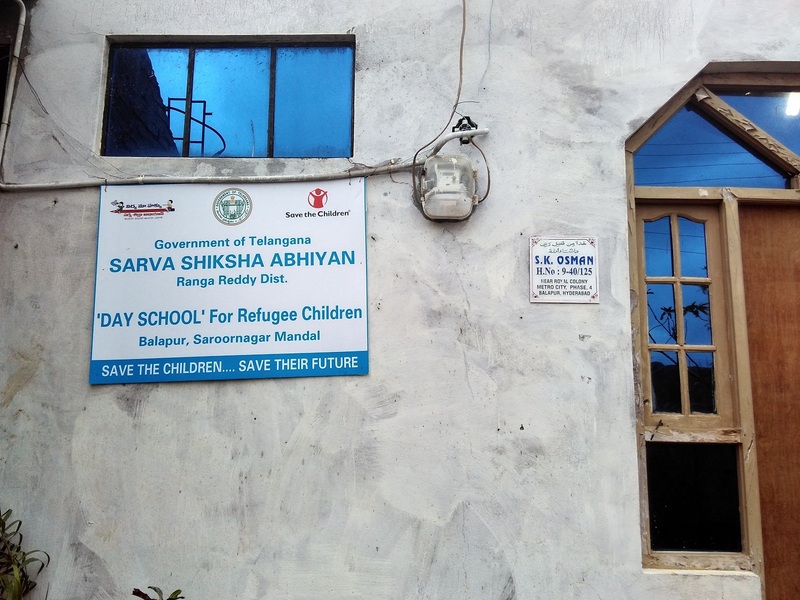 Whatever the children's legal status, (all 110 students have UNHCR refugee cards, which can be renewed every two years), the Sarva Shiksha Abhiyaan, which funds the school, sees reason to proactively help. “We aren’t interested in their background," said G Kishan, the state project director of the Sarva Shiksha Abhiyan. "We have to provide the [Rohingya] with minimum basic rights, like education. Otherwise they can grow up to become anti-social elements. They can create any kind of issue tomorrow." For decades, rights activists and academics have criticised India’s treatment of refugees for being influenced by political priorities. India is anot a signatory to the 1951 UN Refugee Convention and its 1967 Protocol – which govern how 144 nations address refugees. And while the country has a long history of accepting refugees from South Asia and beyond, it has never formalised them within a national legal framework. This has meant that while vast numbers of Sri Lankan Tamil and Tibetans have benefitted from direct aid either by state or Central governments, other refugee groups, who have been in the country for years, like Afghans, Rohingya, Somalis, Iraqis and others, are left to the limited purview of the UNHCR. This division persists with little explanation. In this arbitrary system, the UNHCR operates out of Delhi and in other cities via partner organisations to issue refugee cards to those to whom it grants refugee status. The card improves a refugee’s access to basic services like education and healthcare while providing some protection from detention and deportation, said Ipshita Sengupta of the UNHCR. It is also a launching point to apply for long-term visas. In 2011, the UNHCR said there were more than 2,00,000 refugees and asylum seekers in India, most of whom are Sri Lankan Tamils and Tibetans. Others claim the number is higher. As of June 2016, only 36,500 refugees and asylum-seekers in the country were registered with the UNHCR. Consonant with the BJP’s 2014 election manifesto that declared the country “a natural home for persecuted Hindus,” last week’s Cabinet move, first introduced in 2015 by the Ministry of Home Affairs, not only skirts the issue of inconsistency, it expands it by dividing refugees in India by religion. "While India has accepted several refugees from countries in the region, it is important that it end the ad-hoc nature of its refugee policy and the uncertainty and arbitrariness in the treatment of asylum-seekers and refugees,” said Shailesh Rai, senior policy advisor at Amnesty International India to Scroll.in via email. To Rohingya refugees like Zubair, India is somewhere to stay. He reached Hyderabad in 2013 after crossing the Naf River from Rakhine state into Bangladesh. There, he stayed in Cox’s Bazar, where 35,000 Rohingya live in squalid government-run camps, for two days before he left for the Indian border. Distant family that was already here told him that Hyderabad was friendly to the Rohingya.